What can we learn about haiku from Jack Kerouac? Its great to read haiku books and see the poems of other poets, but what I love even more is hearing about the poetic life of other haiku poets. For this reason, the twenty-nine page introduction by Regina Weinreich was one of my favorite parts of this book. For those of us who came late to haiku, its difficult to imagine the situation in the 1950s and 1960s when Blyth almost single-handedly introduced the English-speaking world to haiku. Beat poets like Kerouac, Ginsberg, Philip Whalen and Gary Snyder, were at the forefront of deciding what to do with Blyth's interpretation. Where should the lines be drawn? "I propose that the 'Western Haiku' simply say a lot in three short lines in any Western language. Above all, a Haiku must be very simple and free of all poetic trickery and make a little picture . . ."
After introducing us to Kerouac's way of thinking about haiku, Weinrich then tells us about his method of composition. Kerouac carried tiny bound notebooks in his shirt pocket where he could readily put to paper any haiku he found in his vicinity as he went about life. Weinrich's own knowledge of haiku was supplemented, she tells us in the Acknowledgements, by advice from Cor van den Heuvel (whose interest in haiku began after reading The Darma Bums), Lee Gurga, and Alan Pizzarelli. She admits to ignoring their advice in several instances and including in the collection haiku that her advisers considered "clinkers" in order to show a more well-rounded picture of Kerouac's haiku practice. Sutra - what to think? Shall I break God's commandment? Is this a tremendous book of haiku? No. 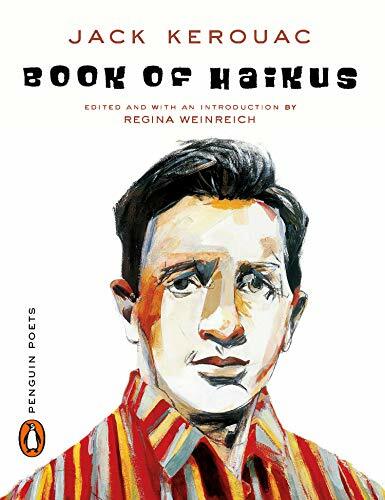 But it has a significant place in the history of the development of English language haiku, and it paints a clear picture of Jack Kerouac's involvement in that movement, and his personal commitment to haiku.